Shirts With Random Triangles: Video: Mississippi St. Head Coach Dan Mullen Training To Run Boston Marathon. 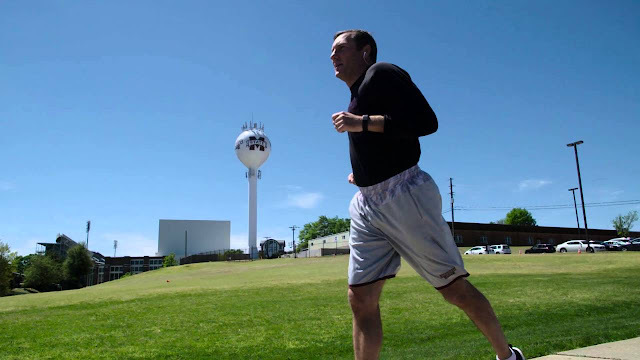 Video: Mississippi St. Head Coach Dan Mullen Training To Run Boston Marathon. Dan Mullen. Image via YouTube. Mississippi State Dan Mullen will be running in the Boston Marathon on Monday. He's doing it to help raise money for his Mullen Family 36 Foundation, which aids children's' charities in Mississippi. The foundation released a video of Mullen training for the Marathon on Thursday. Mullen says he was inspired to run the Boston Marathon after hearing an Adidas representative tell the story of his wife who has run the Marathon in 2014. She had witnessed the Boston Marathon bombing a year earlier, leaving three people dead and 260 others injured. Mullen's goal is raising $36,000 for his foundation, of which $14,000 has already been raided. Mississippi St. fans will be able to track Mullen's progress via The Boston Marathon's mobile app, using his bib number #29394.